Yesterday I was due to have an endoscopy of St Vincent's Hospital and stay there overnight. Arrived, as requested, at 11.30am only to be told the doctor wasn't there till 1pm and that my appointment had been changed to 23rd March !!!!! Apparently the new Registrar hadn't phoned me to let me know about the change and as my procedure takes all the afternoon list time they couldn't just fit me in the following day (they'd have needed to cancel 7 other appointments). So back to waiting again - I am feeling a bit worried though knowing that it's not just a 15 minute procedure but rather in the hours - sounds a bit more complicated than I'd thought. The best thing happened this morning - I was looking out the window and a man went bustling by - crossing my site - I was just thinking, how rude, when he came back and looked in the door - there stood Jim (from Scotland) - he and Linda knew we were here, and after finishing their trip along the Great Ocean Road, decided to drop in for a day or two . 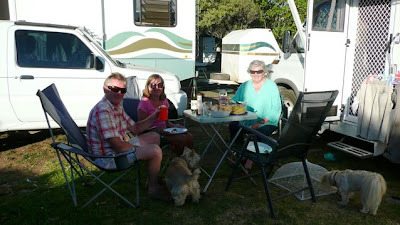 I met Jim and Linda early 2008 in Esperance WA - they spent 2008 travelling around Australia in their motorhome, returning to Scotland in January 2009 (coming to visit me in hospital before flying home). We met up again quite a few times, at Busselton, Yungaburra, Mission Beach and then last November they suddenly appeared again - this time spending 5 months in Australia - they're returning home next week.